Update: As of Tuesday morning, March 22, we have more than 300 open work orders to fill between our two bases in Louisiana. That’s a lot of work to do—please pray for more volunteers. You can find out more and sign up from here. Some parts of Louisiana received more than two feet of rain recently, causing historic—and deadly—flooding. Thunderstorms continue and the water is still receding in some places. 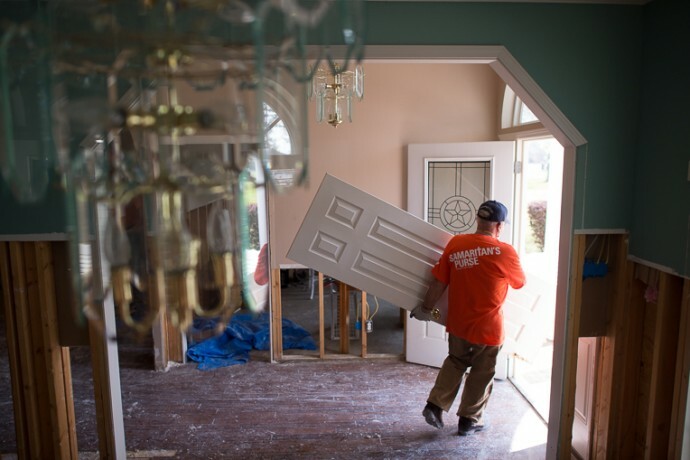 Since March 14 Samaritan’s Purse staff and volunteers have been coming alongside local churches to minister to distressed homeowners dealing with flooded houses. 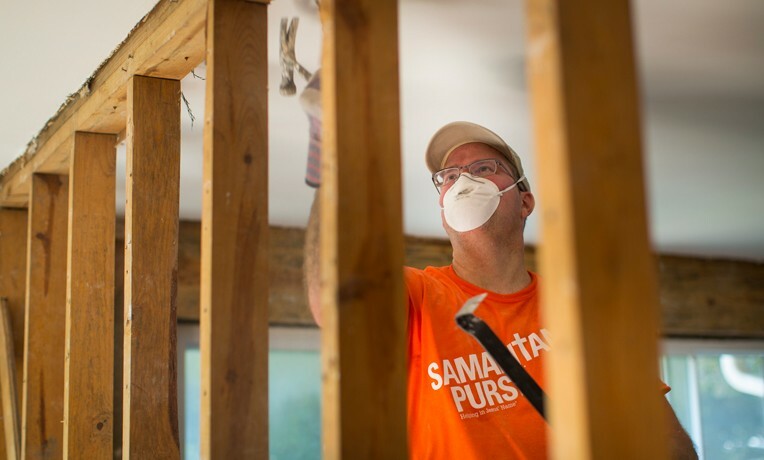 Samaritan’s Purse deployed two program managers and two disaster relief units to the hard-hit state. Our disaster relief units are tractor-trailers stocked with heavy-duty tarps, generators, and other tools that will be used in cleanup efforts. Dozens of volunteers are now helping on a daily basis, but more are needed given the number of work orders we hope to complete. As homeowners are able to return, our teams are cleaning mud out of flooded houses and removing waterlogged belongings. They are also tearing out damaged drywall, insulation, and flooring, and spraying chemicals designed to stop mold growth. Samaritan’s Purse teams work in the Name of Jesus Christ and are prepared to share a Gospel witness. They pray with residents and present them a copy of The Billy Graham Training Center Bible upon completion of the work. Billy Graham Evangelistic Association Rapid Response Team Chaplains are working together with Samaritan’s Purse staff and volunteers to also provide emotional and spiritual encouragement to flood victims. 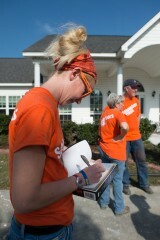 Kayla Muth signs a Bible for a homeowner in Louisiana. Kayla Muth of Honesdale, Pennsylvania, worked on a home in north Monroe alongside other volunteers from Mississippi, Louisiana, Minnesota, Texas, New York, and Illinois. She first started volunteering with Samaritan’s Purse U.S. Disaster Relief in the wake of Hurricane Sandy (2012) and has been on a dozen or so deployments since then. Steven Bruno and his father Mike of Long Island, New York, were among those volunteering on the same home with Kayla. They, like her, began regularly working with Samaritan’s Purse after Hurricane Sandy. 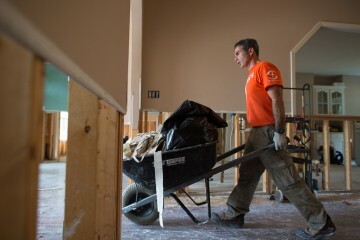 Volunteer Steven Bruno removes drywall and insulation from a home in Monroe, Louisiana. A base has been established at White’s Ferry Road (WFR) Church, located at 3201 N. 7th Street, West Monroe, LA 71291. There it is our pleasure to be partnering with WFR Relief, a ministry of our host church. We are hearing reports that as many as 2,000 homes and businesses flooded in the Monroe area. Residents are shocked and devastated. A second base has been set up at Bellaire Baptist Church, located at 1210 Bellaire Boulevard, Bossier City, LA 71112. Overnight volunteers are being accepted at both sites. Governor John Bel Edwards declared a state of emergency across all of Louisiana on March 10. The federal government more recently declared a number of parishes to be major disasters, including Bossier (our Bellaire base) and Ouachita (our WFR base). 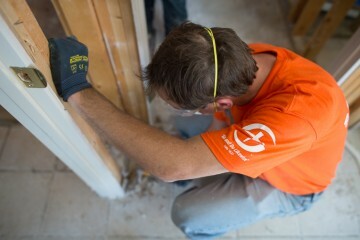 Please continue to pray for affected homeowners and for the ministry of our teams.